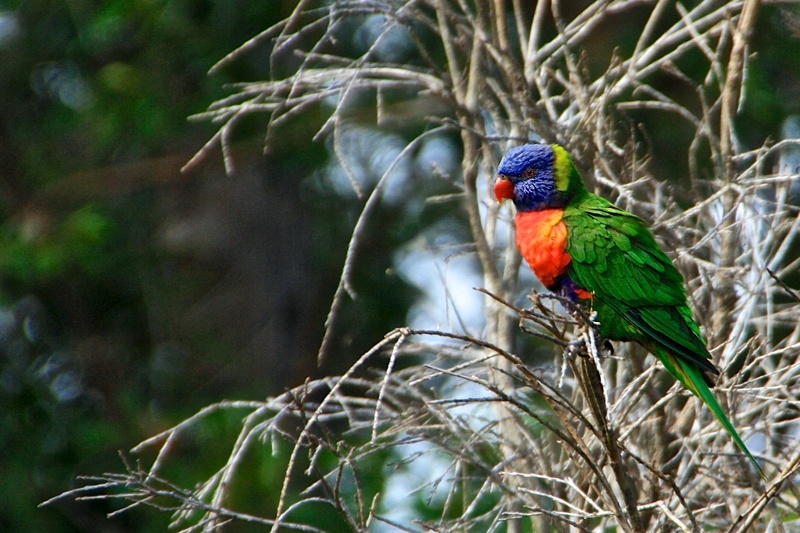 More birds from the Currumbin Wildlife Sanctuary visit. 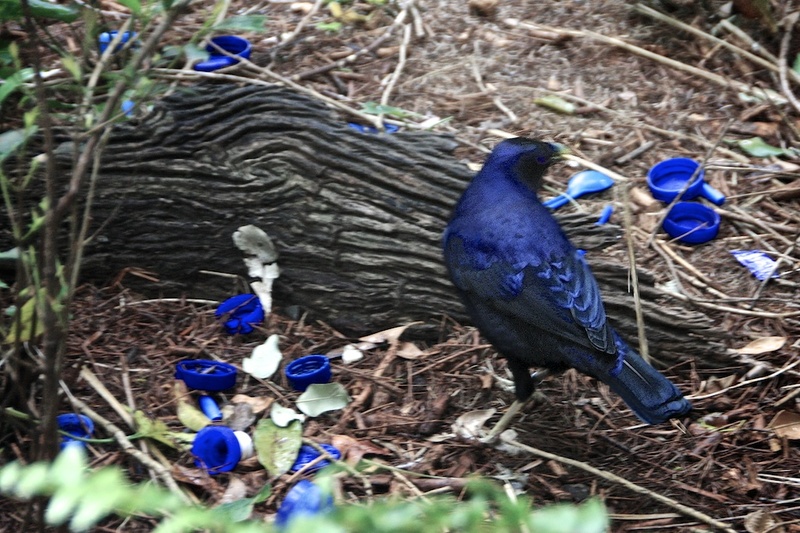 The male Satin Bower Bird collects blue items to decorate outside the bower he has built for his girlfriend. He also dances around the bower to attract his mate. 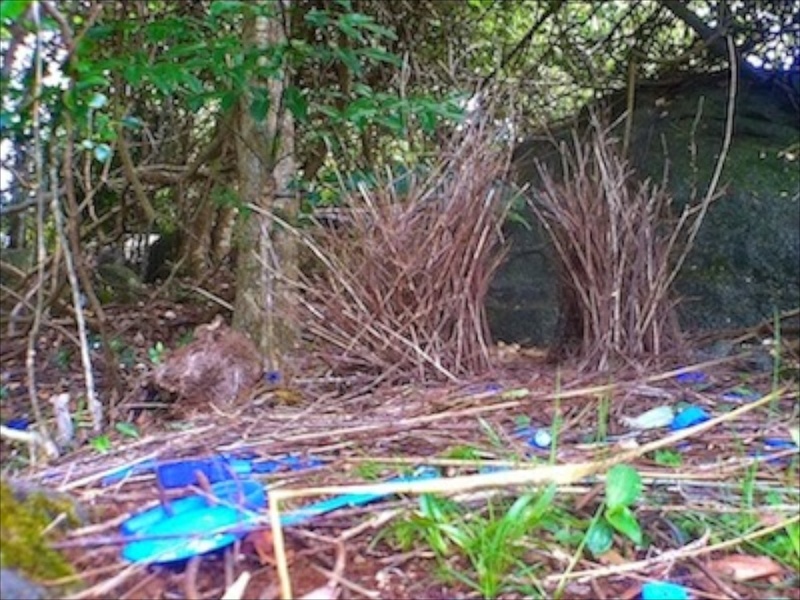 Mr Bower bird has to woo his girlfriend in a bower he especially builds on the ground for the wooing ceremony. The Bower Birds build a nest in a tree for their eggs . 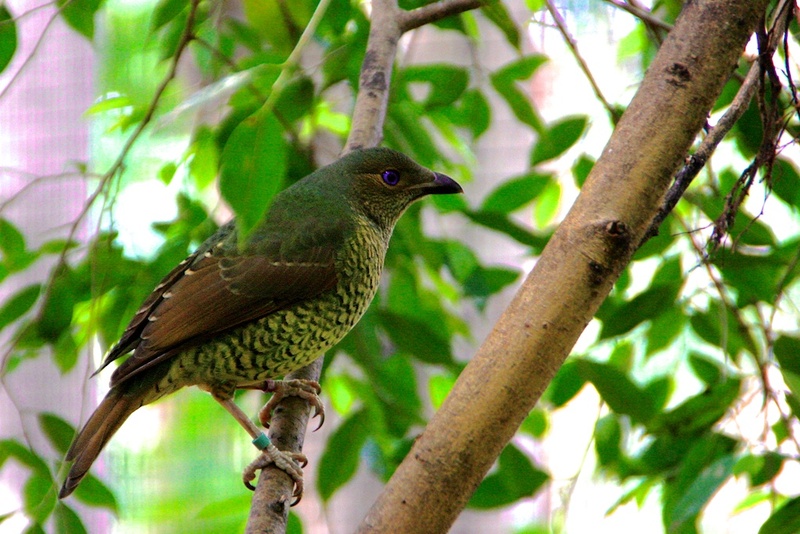 The female Bower Bird is watching her prospective mate dancing about the bower and its blue decorations wondering if he's good enough for her. She isn't the dark blue satin colour of her mate but she has beautiful purple eyes. 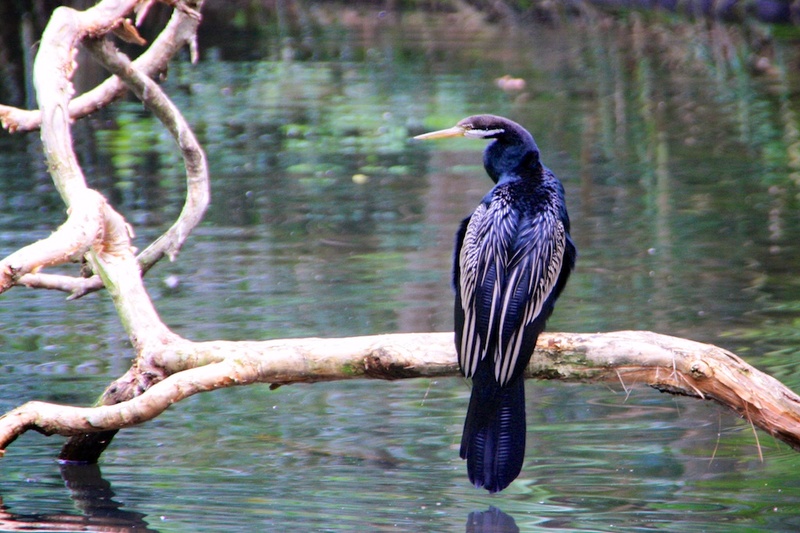 The Darter has a long snake like neck. 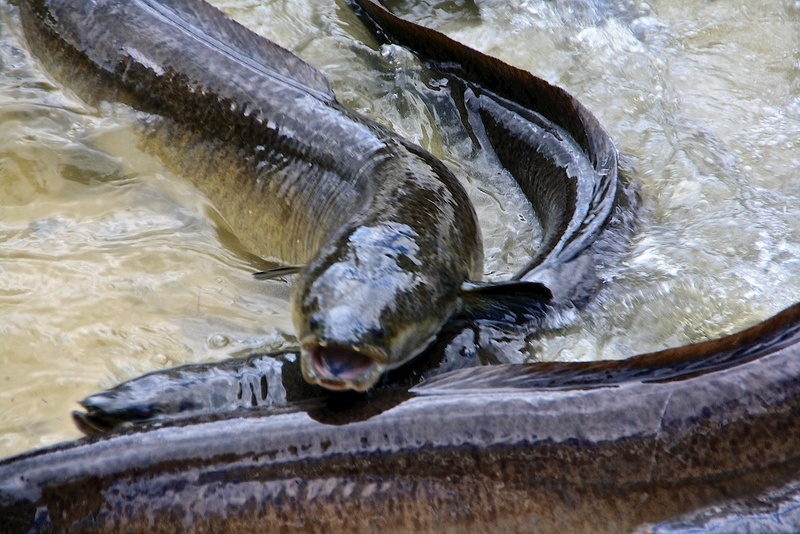 It swims low with just the snake like neck visible. It dives often. 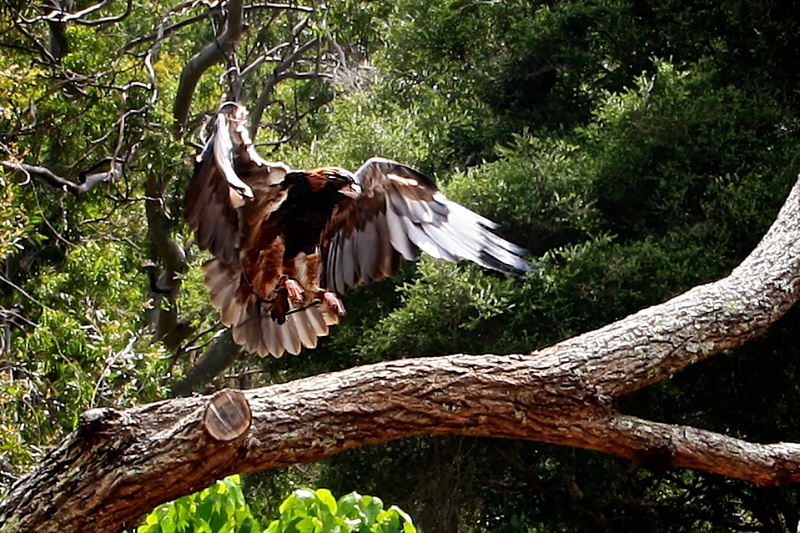 The Black Breasted Buzzard is a medium sized rapture. 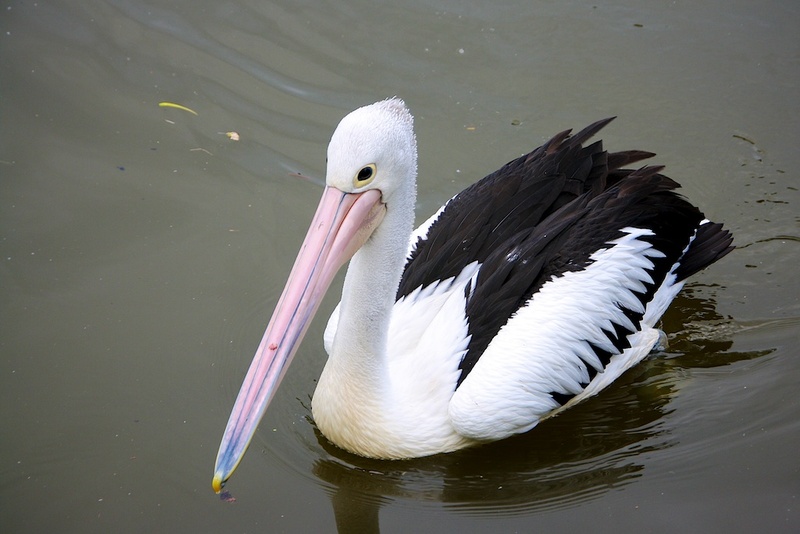 It is about 60cm long with wing span of 155 cm and weighs 1.4 kg. 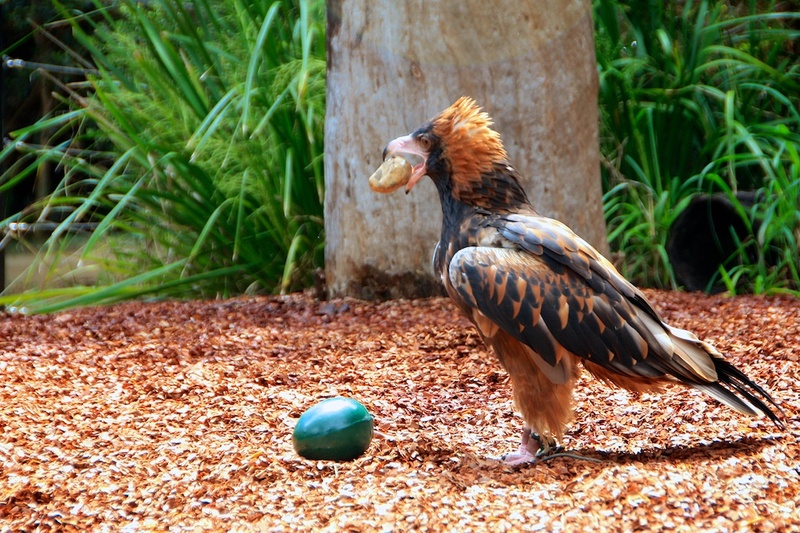 It cleverly uses a rock to throw down on an emu egg to break the tough shell. It will do it again and again until it can break open the egg with its beak. 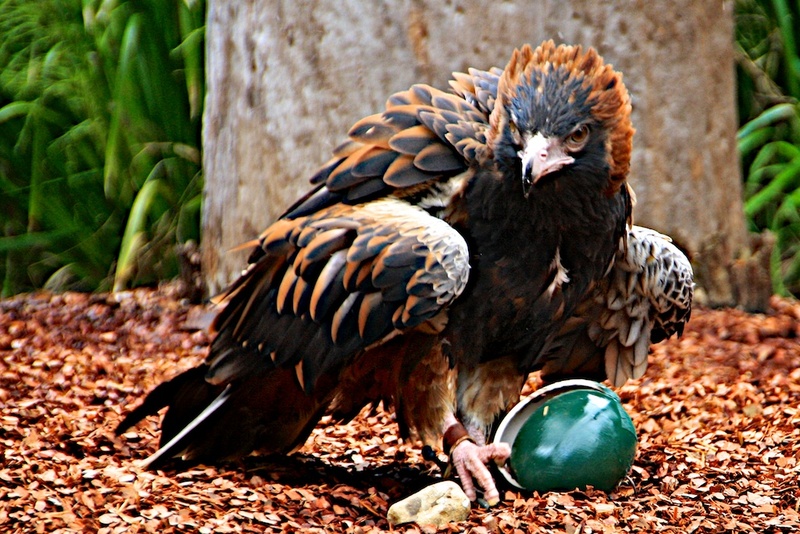 This was a fake egg for the show but it had meal worms inside for the Buzzard to eat. I was impressed with this act. Just before the end of the show it started to rain. 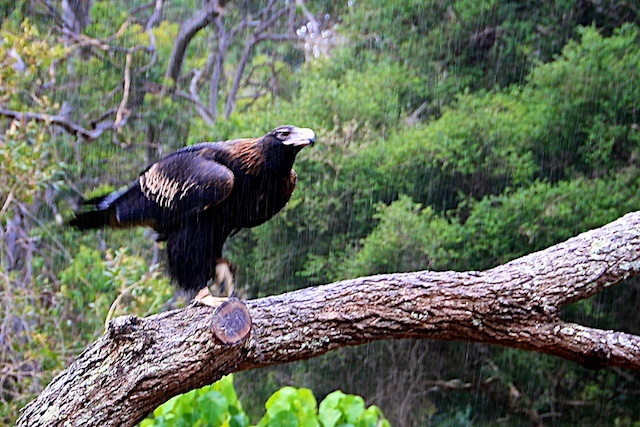 I had to hide my camera under my jacket and it was hard to get shots of our biggest eagle , "The Wedge Tailed Eagle" He zoomed closely over our heads to land on the tree perch. 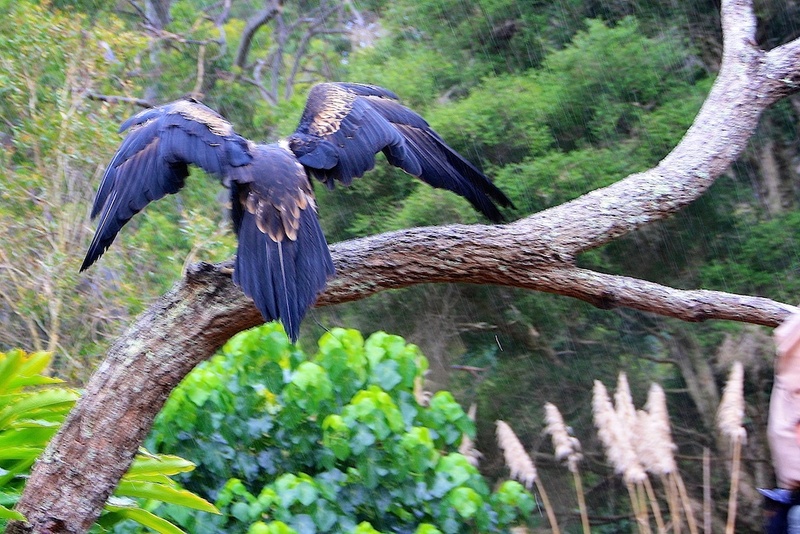 He stands 1m tall with a wing span of 2.2m and weighs 5kg. He eats rabbits, baby wallabies, rats, mice and other small mammals. 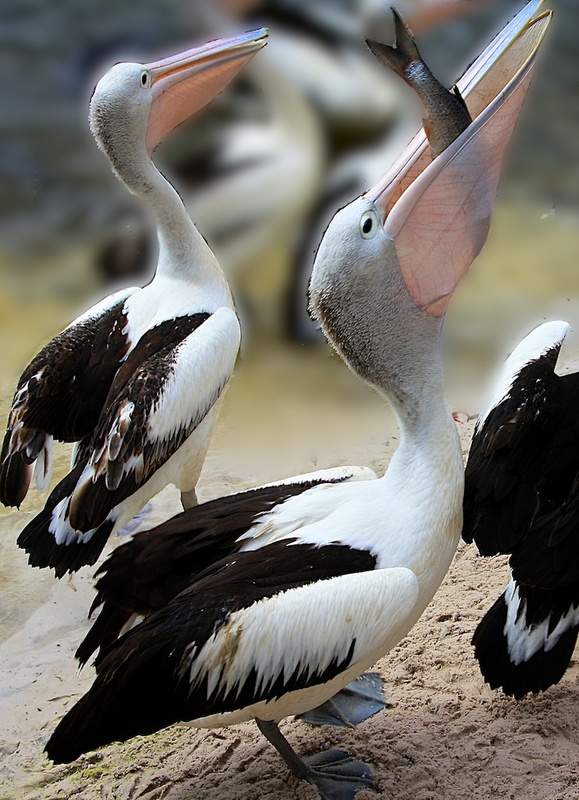 CAN A PELICAN'S BEAK HOLD MORE THAN HIS BELLY CAN? 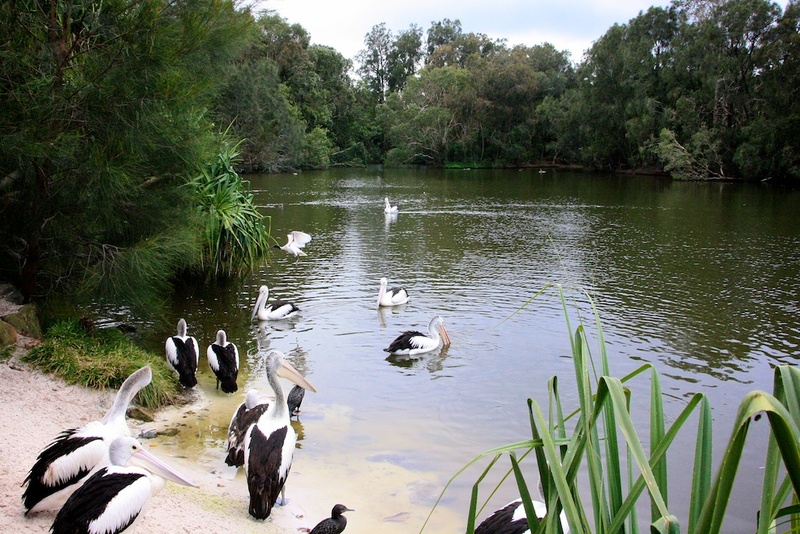 At feeding time for the Pelicans and Eels at Currumbin Wildlife Sanctuary, the Pelicans circle in the sky, swoop down and ski across the water to a stop. 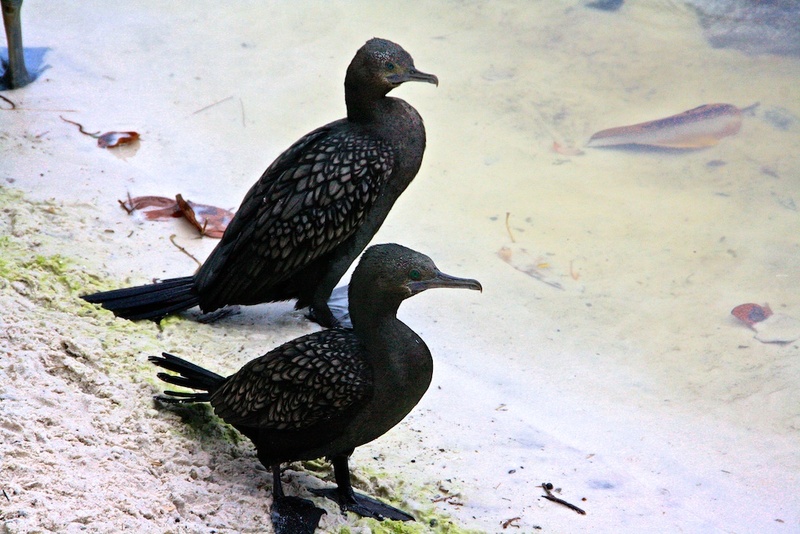 Some cormorants with purple eyes were hoping to get some food too. 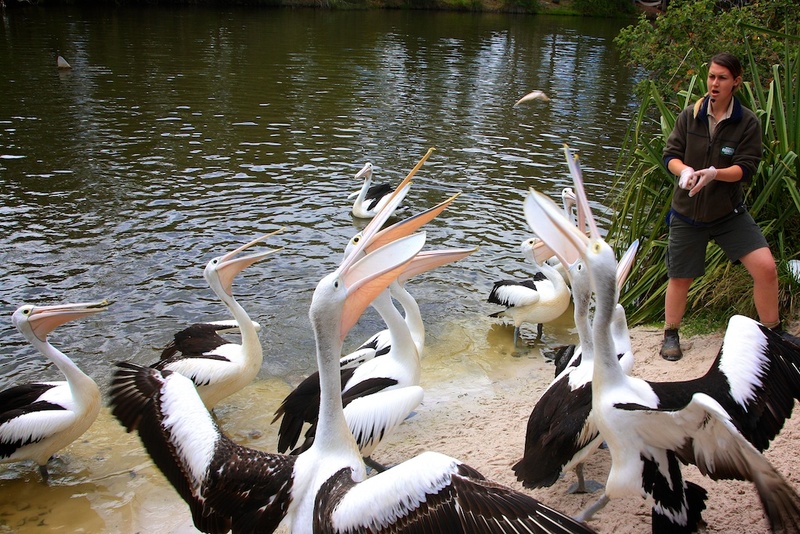 Soon the keepers arrived and threw fish for the birds and all the time giving an informative commentary. 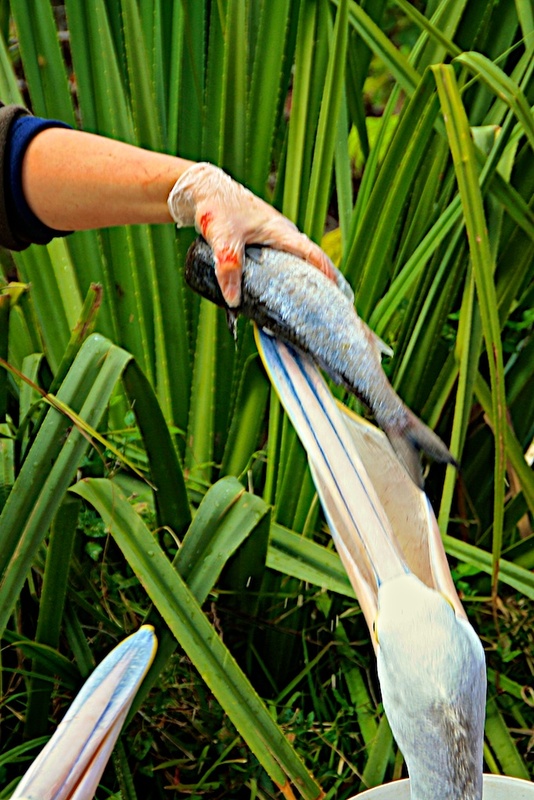 The keeper explained how the pelican will turn the fish around in its beak so that the fish goes down head first so that the spines on the fins won't get caught in its throat. 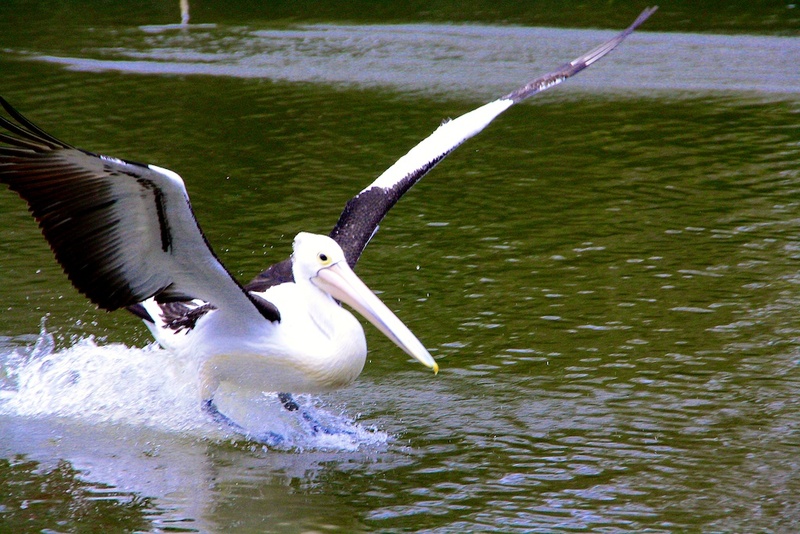 She purposely gave one the fish tail first so that we could watch the pelican juggle it around and gulp it down head first. 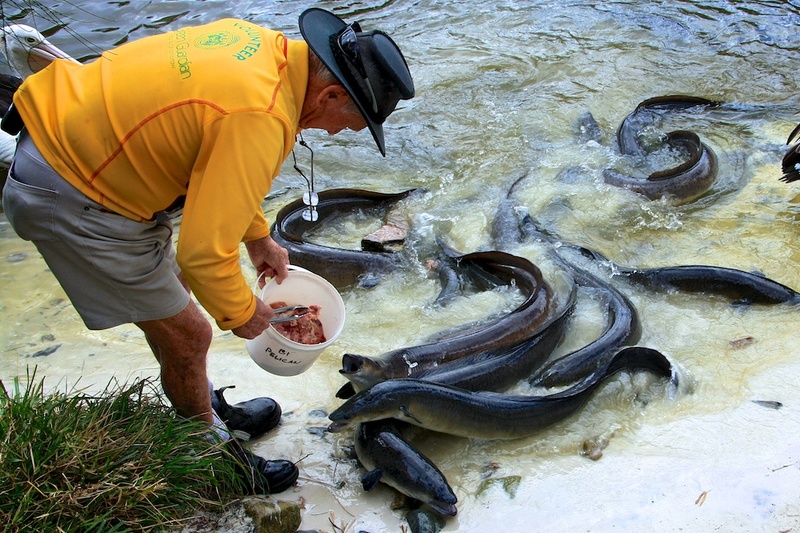 Then it was the Eels' turn to be fed chicken pieces. The keeper tapped the water with his foot and they all came swimming up onto the sand. They can't see very well and they wave their head around trying to find the food. I think they use sense of smell to find their prey. The slippery, slimy dudes were hard to capture as they were in a squirming, seething feeding frenzy. So the shot is blurry. Joining in with Saturday Critters see more interesting critters here. 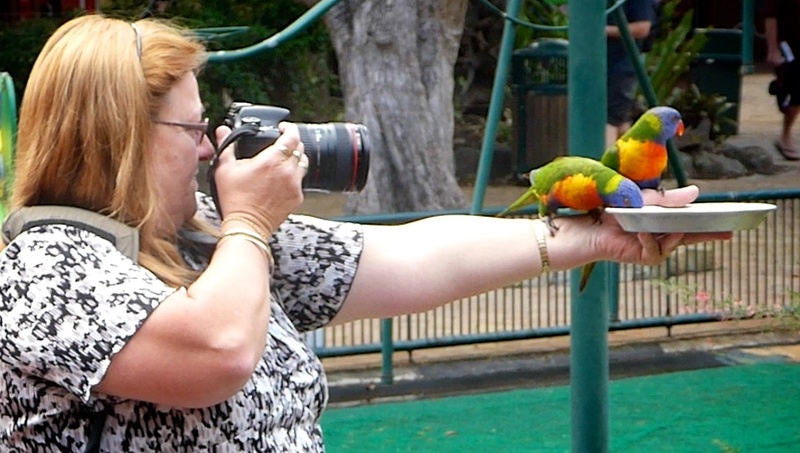 At camera club we have been learning about bird photography so a trip to the Currumbin Wildlife Sanctuary was organised. The sanctuary has an interesting history: Alex Griffiths moved from NZ and bought a 26h property in Currumbin in 1944, where he grew flowers. 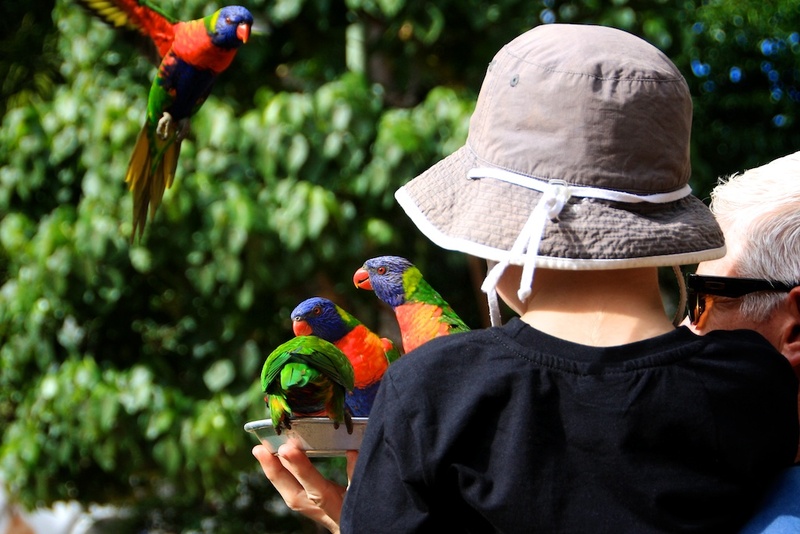 To stop the lorikeets from ruining the flowers he started feeding them with a honey mixture so that they would leave the flowers alone. Every evening at 4:30 flocks of the wild honey eaters would fly into his property to be fed. It soon became a tourist attraction. 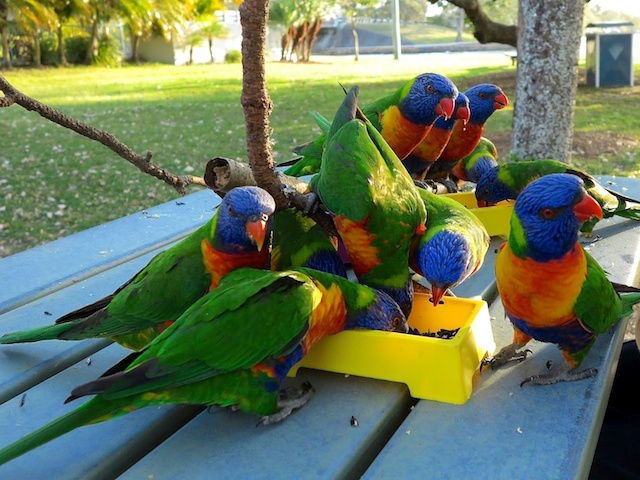 In 1956, National Geographic wrote an article about the flocks of wild birds that came to be fed at Currumbin. This increased the number of international tourists. In 1976 Griffith donated the property to the people of Queensland and it was to be run by the National Trust. 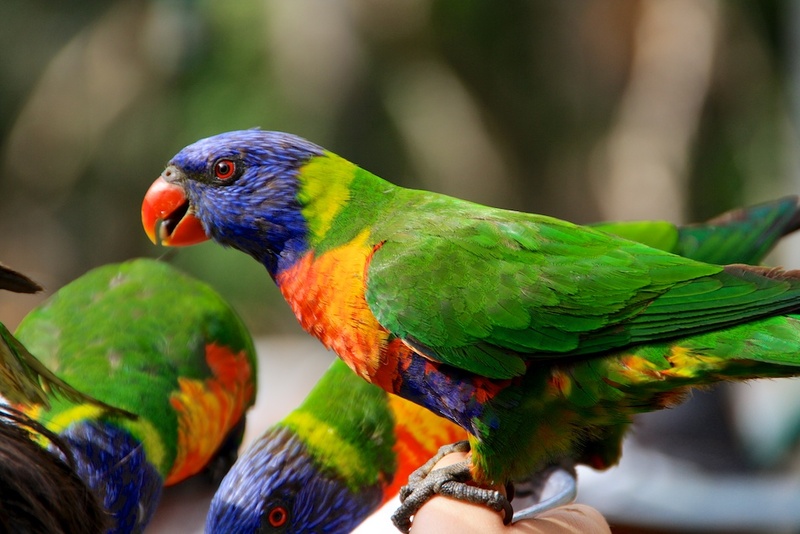 Now it has developed into a great wildlife reserve with lots of shows and activities as well as the largest collection of Australian wildlife species in the world. It also cares for sick and injured animals in its wildlife hospital. They have great educational programs for children too. 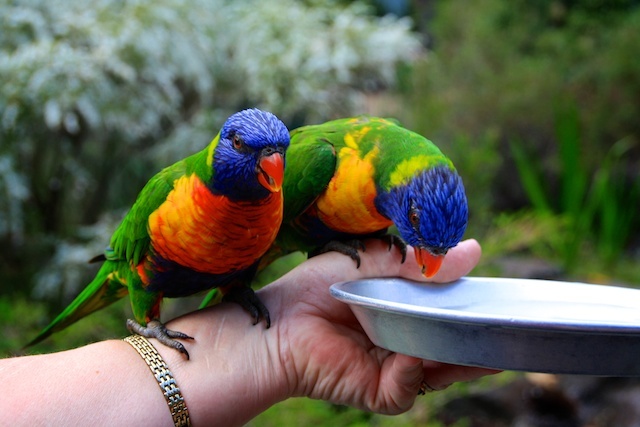 The bird feeding has continued ever since 1947. It is at 8:30am and 4:00 pm. The birds fly in and sit in the trees waiting until the dishes of honey mixture are ready. 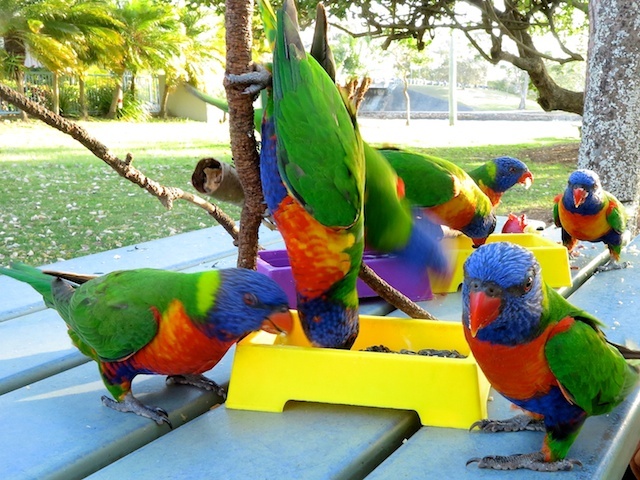 Staff members give tourists the plates to hold and then the birds come in droves . They sit on the plate and drink the solution. They screech and peck each other at times. they sit on your head, your glasses, your arms and shoulders. 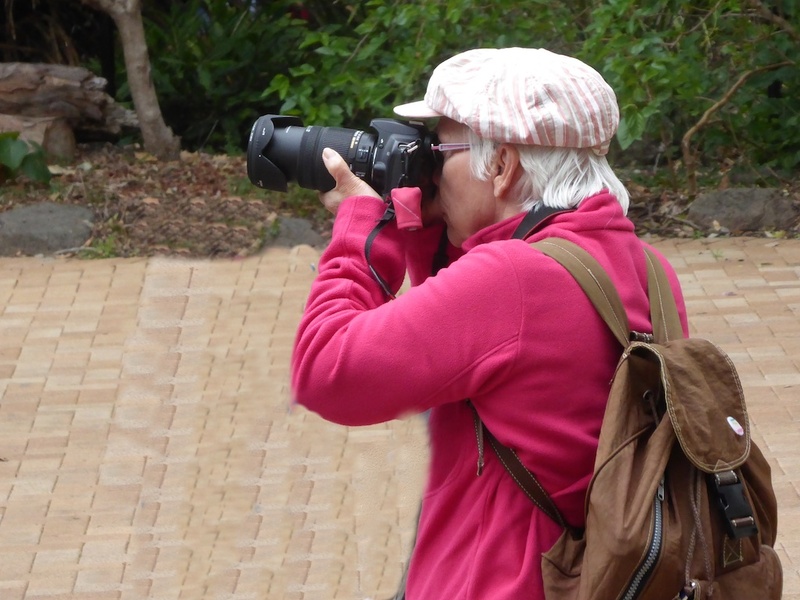 One of our dedicated camera club members, Ros tries to do both; feed the birds and photograph them at the same time. She takes fabulous shots too. It was easier for me as I didn't take a dish. 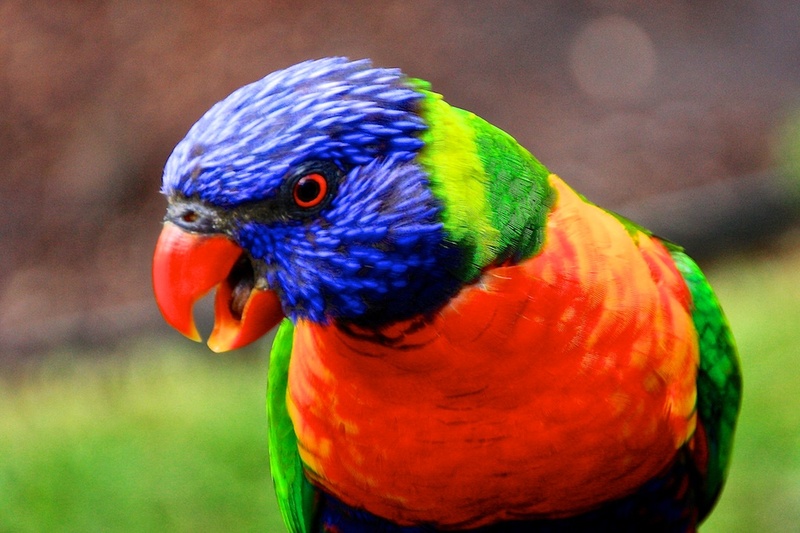 You are probably sick of lorikeets now after this and my last post. 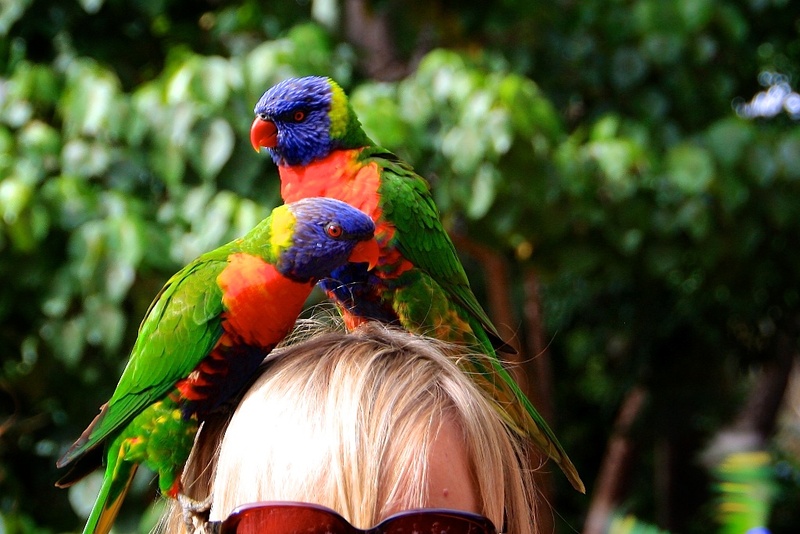 I'll show you some other birds that we saw there next time. 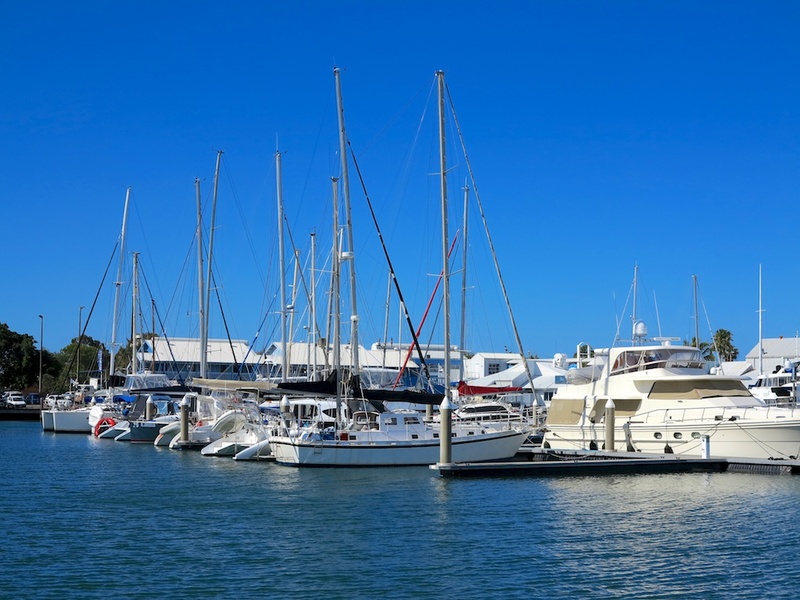 I read on "Whiteangel's" blog "Thoughts and Happenings" that she was on holiday on the Sunshine Coast in Queensland. She and hubby had driven all the way from Tasmania. 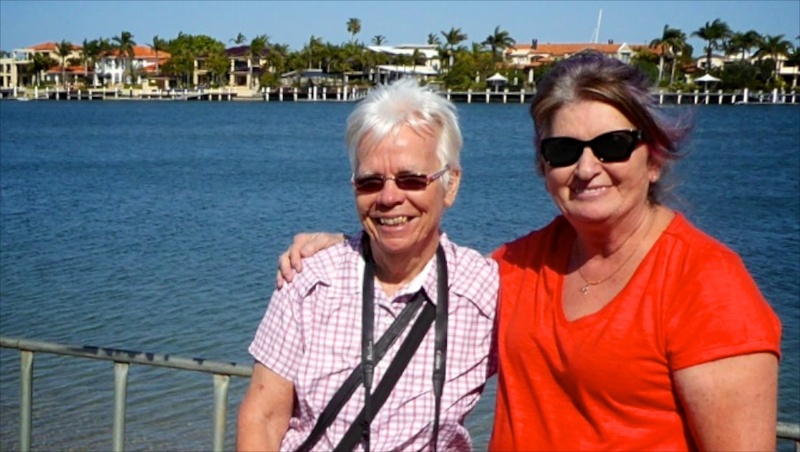 As it is only an hour and a half drive from Brisbane we arranged to meet. 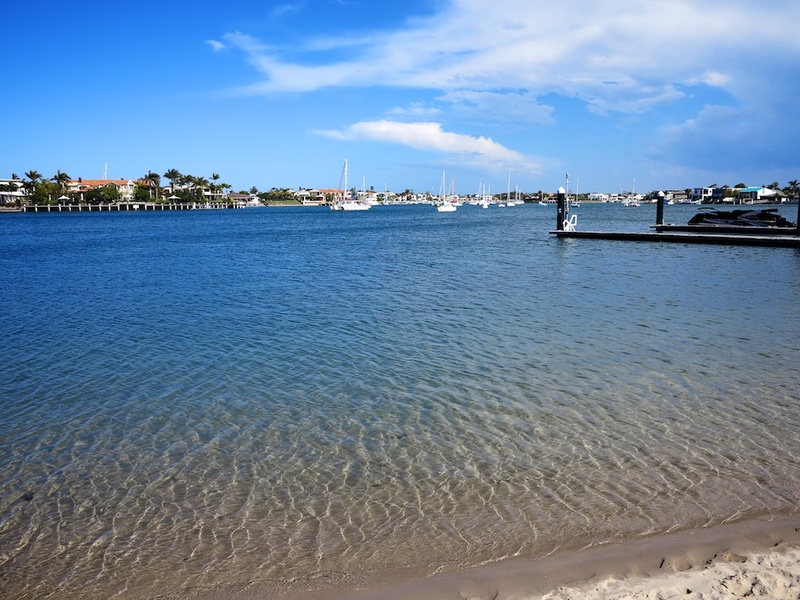 TOH and I drove up to Maroochydore last week and met the lovely couple. We have been blog mates for about eight years so it was fun to meet in person. 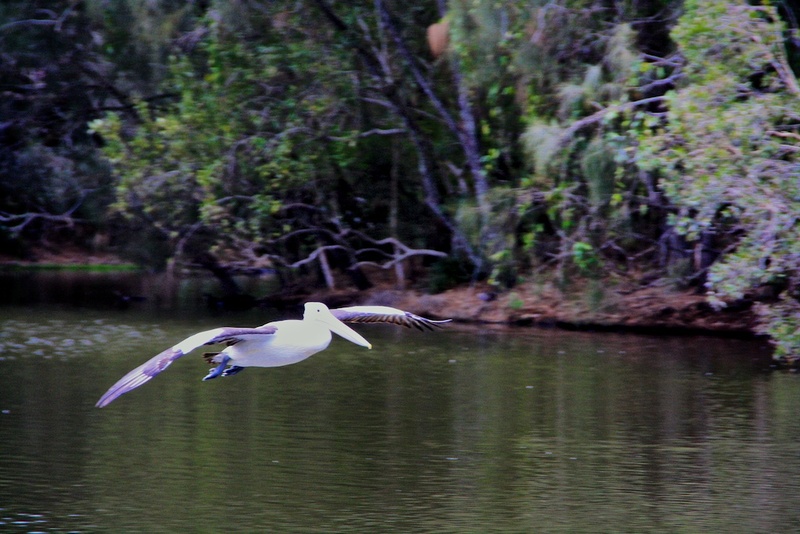 We had lunch together and then we went for a walk by the Maroochy River. It was a warm but windy day. 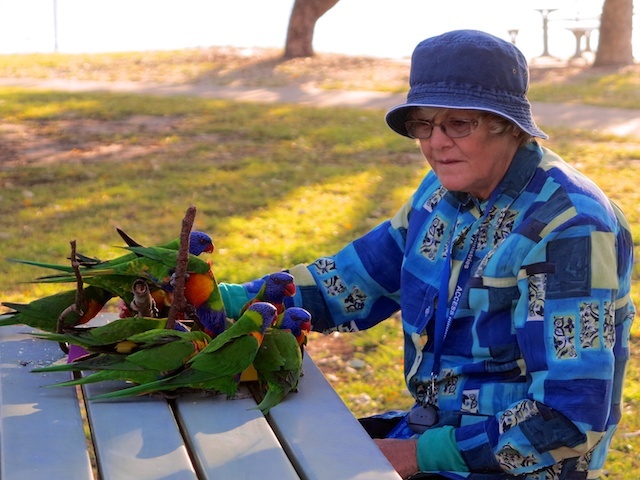 Outside the resort where we stayed there was a lady feeding the lorikeets. Apparently she is a resident and does this every afternoon and cleans up the table before she leaves. 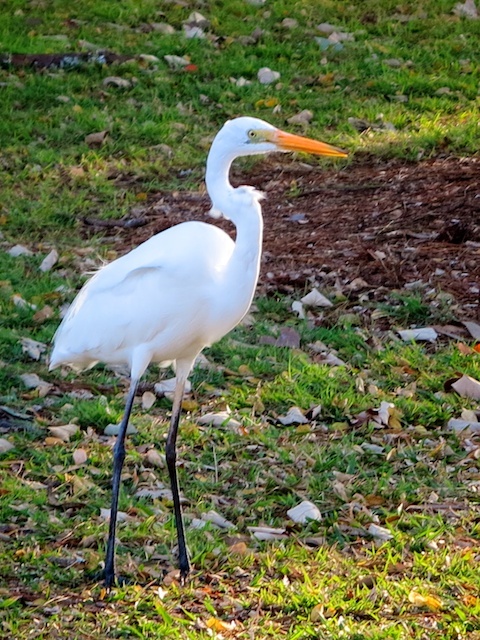 "Clover" the white egret (I think) also came for some hand outs. That evening we had dinner with our new friends and we stayed overnight at the same resort. It was a lovely few days on the coast and great to meet another blogger. 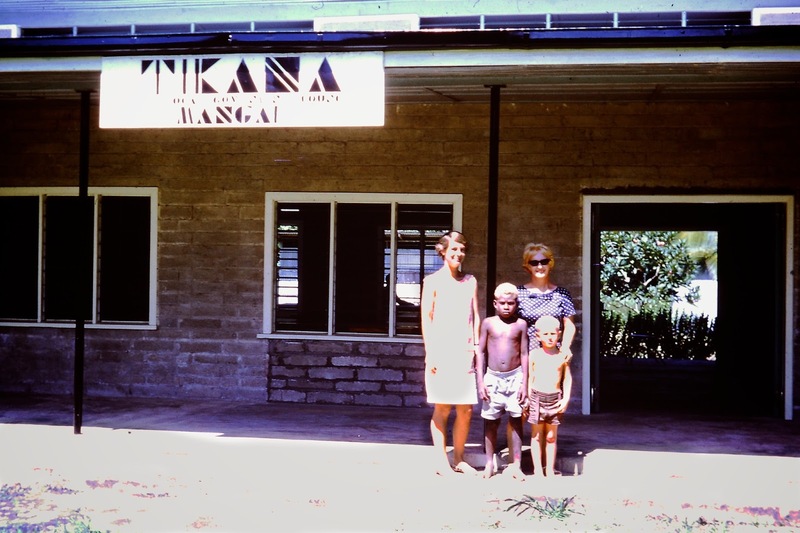 Joan and I were on our last hop of our Papua/New Guinea trip in1967. 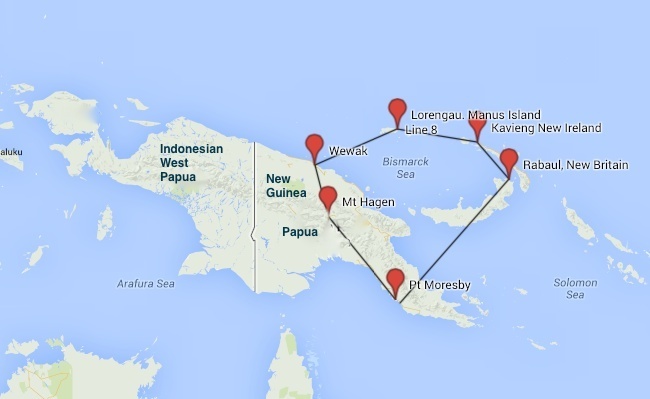 We flew from New Ireland to New Britain, both big islands off the north coast of PNG. 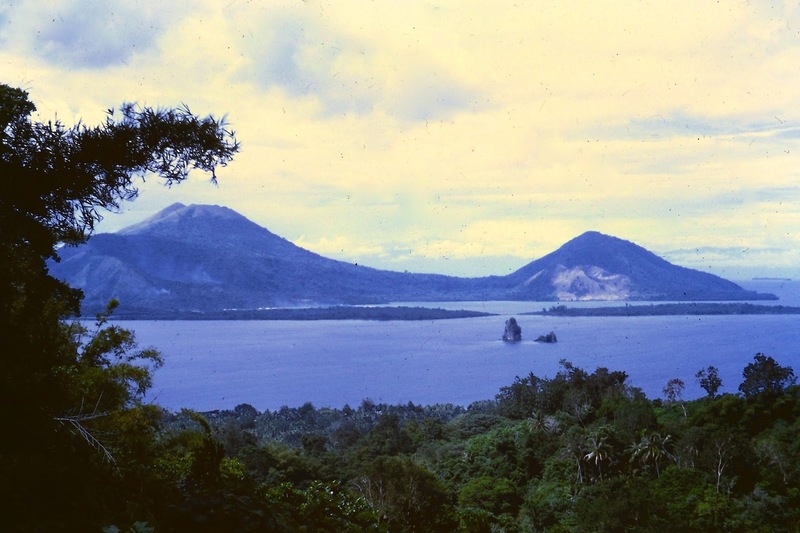 Rabaul is famous for its active volcanoes. 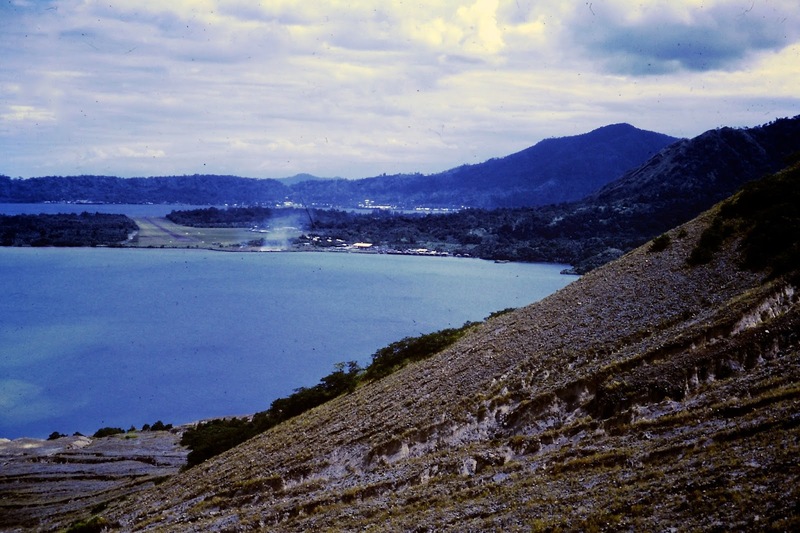 The beautiful scenic harbour is a sunken caldera from huge volcanic action in earlier times. The caldera harbour is surrounded by volcanoes some of them still active. We visited Matupit Volcano. It was quiet but there was steam rising out of vents and the ocean at the edge was bubbling hot. We climbed up the side of the volcano and looked over towards the airstrip and the township behind it. It was quite an experience landing on this strip. Flying down into the caldera surrounded by volcanoes and landing on a strip with water at both ends, it was like an aircraft carrier . When we reached the top we could look down into the crater. 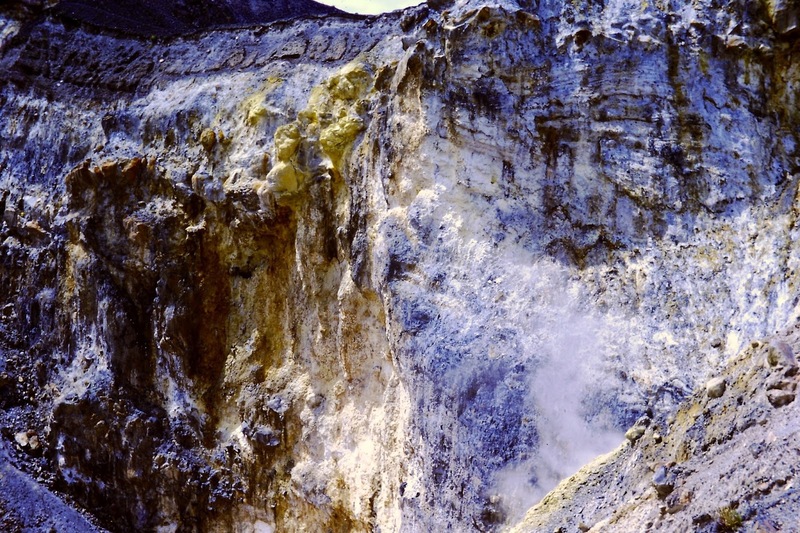 The smell of sulphur was a little overpowering, but it was exciting being on a live volcano. Another day we visited the beaches. They were very different in that the sand was very fine and black as black obviously from volcanic fallout. Needless to say it is a hot tropical island where the children didn't wear much. They were very shy and cute. 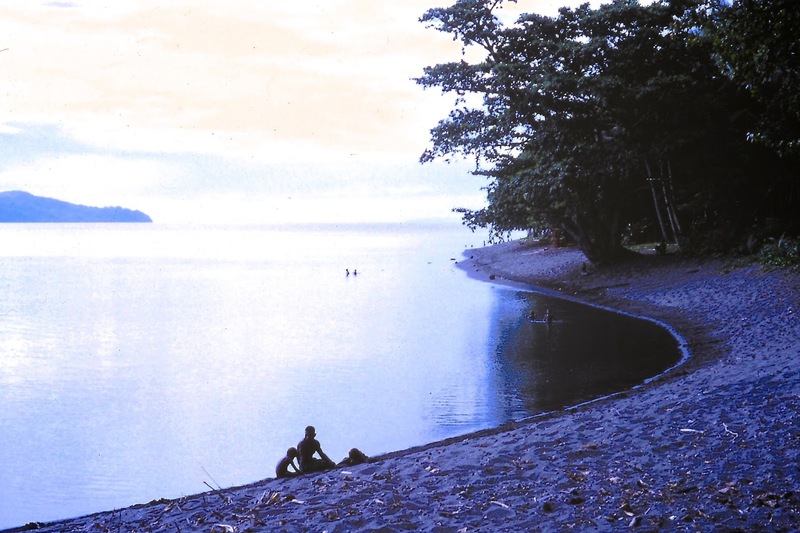 Rabaul has a colourful history as well as geology. It was the headquarters of the German Colony from 1884 to 1914 when it was taken over by Australia as part of the British Empire in WW1. In 1937 Tavurvur Volcano erupted and destroyed the town. 507 people were killed. In WW2 the Japanese invaded and took control. There were 110,000 troupes based there. They intended capturing Pt Moresby and then Australia. 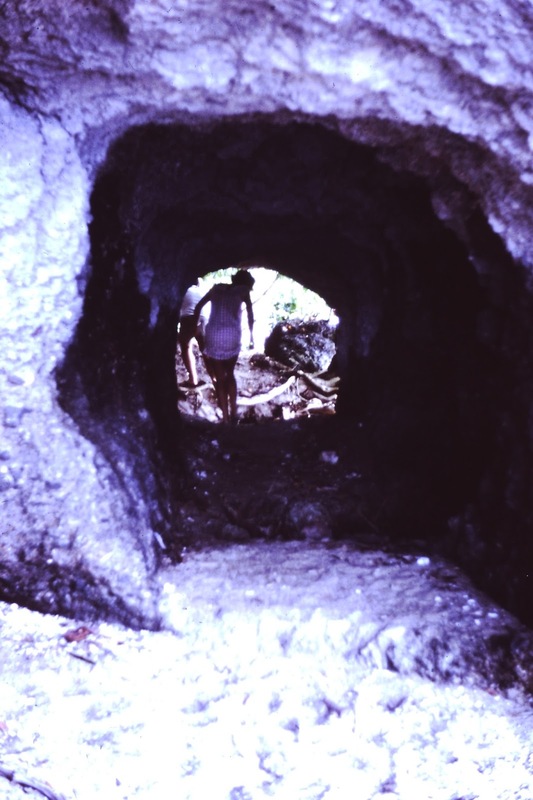 The Japanese built miles of tunnels as shelter from allied air attacks. We walked through some of these tunnels we also saw submarines and landing craft still inside the tunnels. In 1943 the allied forces established bases on islands all around Rabaul and cut off their supply lines and the base became useless. The Australians repelled the Japanese on the mainland on the infamous Kokoda Trail and prevented the fall of Pt Moresby. In 1945 the Japanese surrendered and although Australia had been bombed it was saved from invasion. 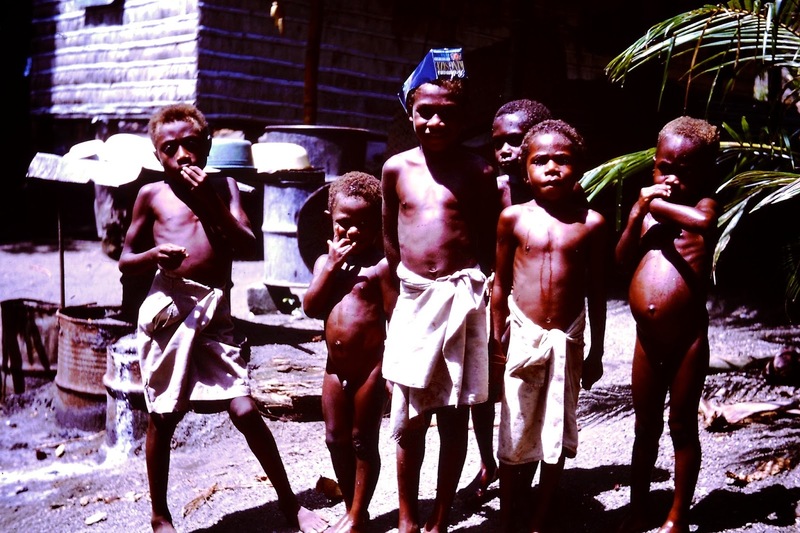 Australia resumed administration of PNG until independence in 1975. 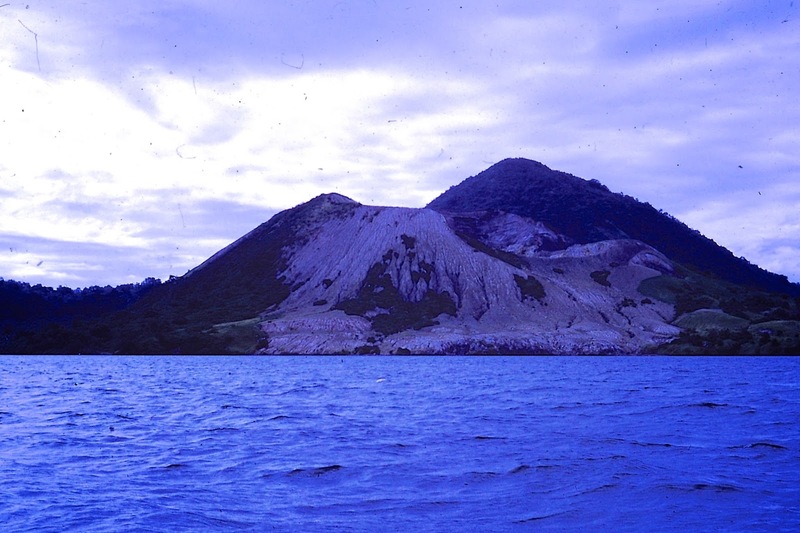 In 1994 Tavurvur and Vulcan erupted. With only 19 hours notice the whole town was evacuated. Five were killed. The whole town was covered in ash and buildings collapsed under the weight. 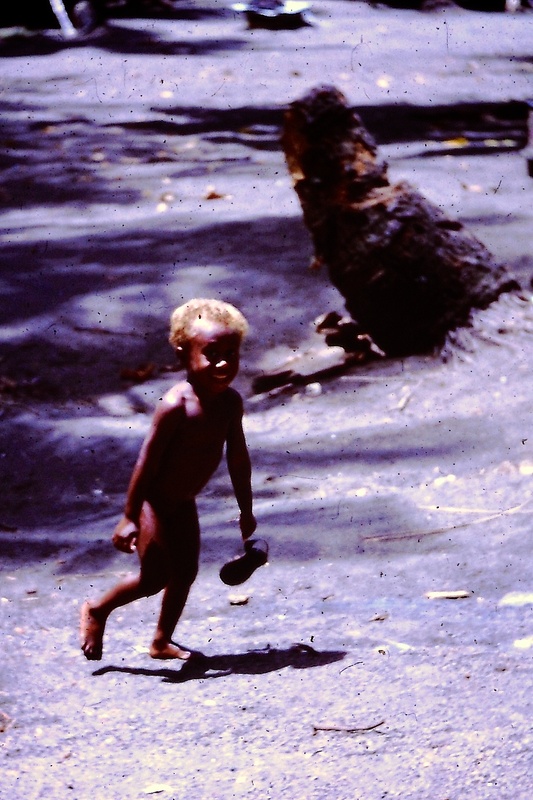 Rabaul was turned into rubble. 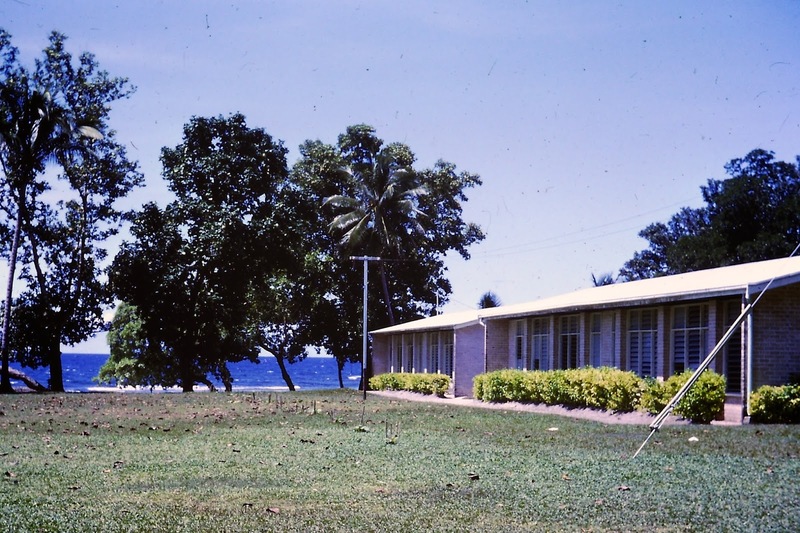 The capital of the province was relocated to Kokopo. We were lucky to see this beautiful town before it was obliterated. Next stop we were home in Pt Moresby ready to start work again. 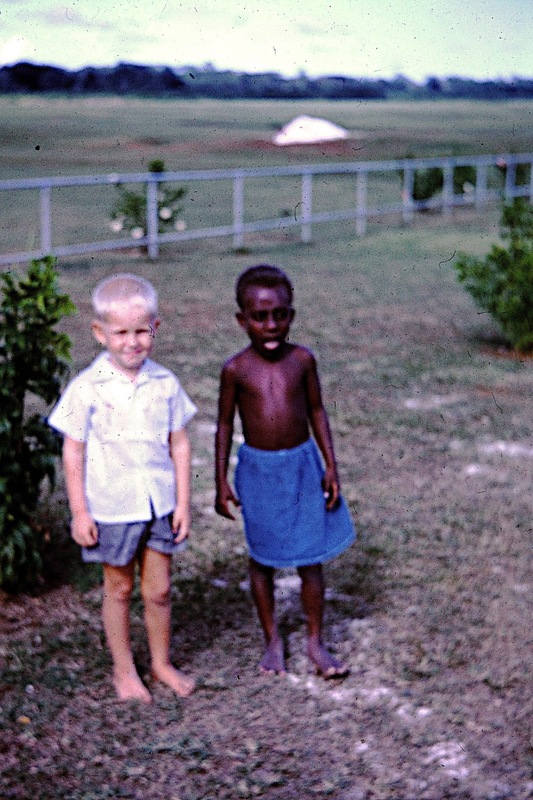 The next hop in our tour of Papua/New Guinea in 1967 was from Manus Is. 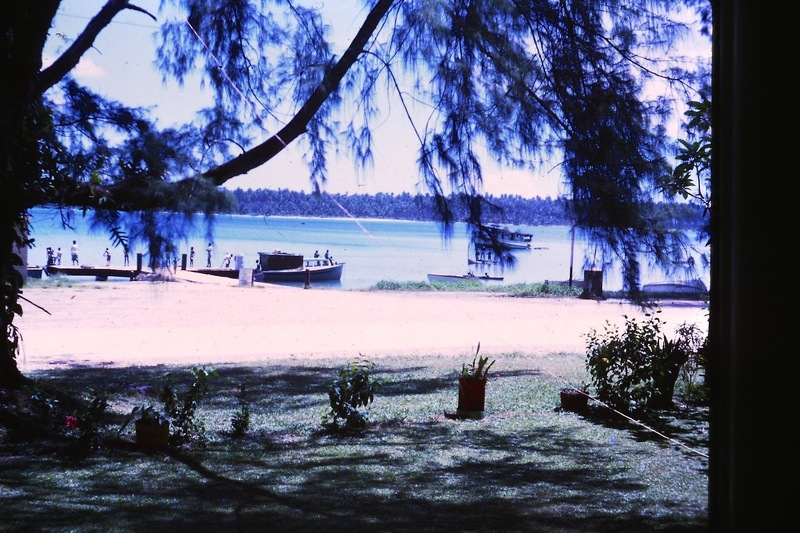 to Kavieng, the main centre on the island of New Ireland. My brother, David, was the District Officer there and I was looking forward to catching up with him and his wife, Ann, and my little nephew, Michael. 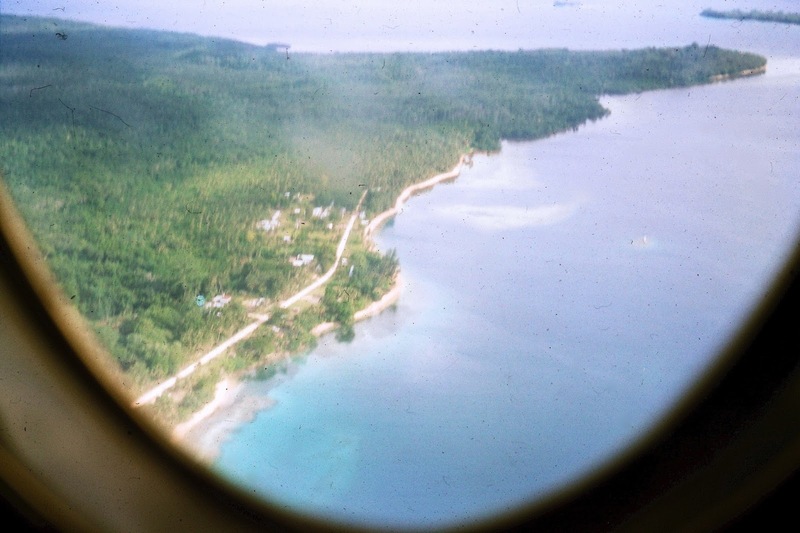 Coming into land at Kavieng. 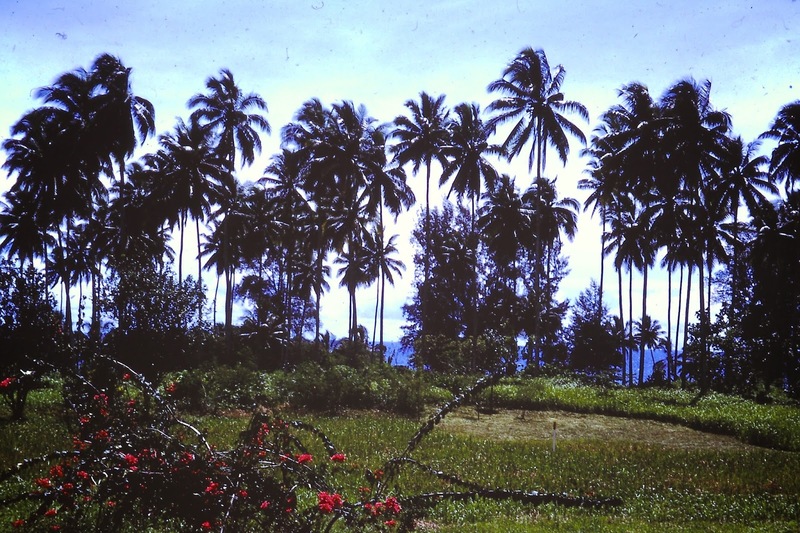 The scenery was so typically tropical island views. The view from my brother's house overlooking the wharf. This is the school where Ann taught. Joan and I had a few wonderful days here. My brother was working during the day but Ann took us around the island. 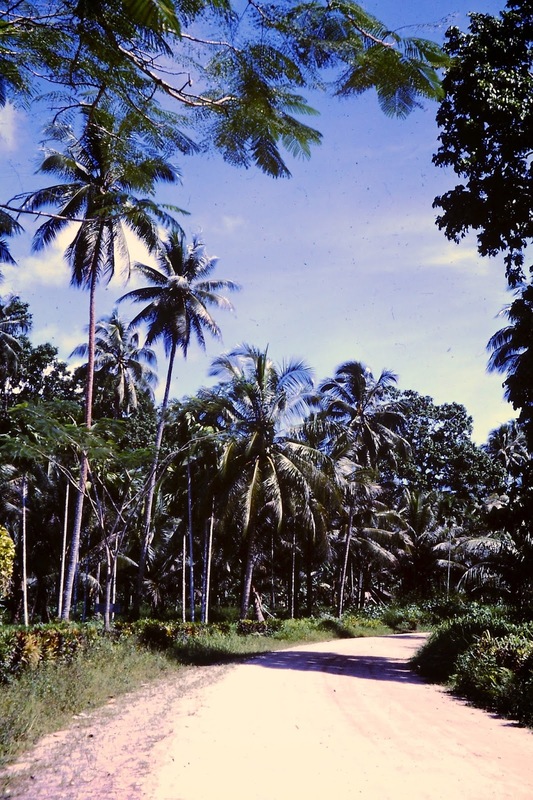 Then it was time to return to the airstrip for the next hop over to Rabaul on New Britain Island. Michael and his friend came to say goodbye. Michael is now in his fifties and lives in St Lucia in the West Indies.